Half the people you know probably belong to some sort of book club. Most love it, some tolerate it, some claim they’re far too busy to read a book every month, and others find fault with the quality of books selected. 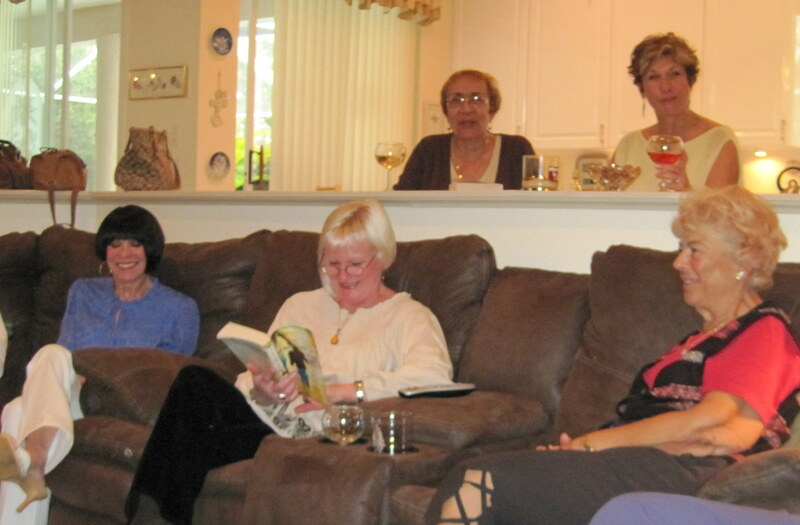 Still the number of book clubs in existence continues to grow, as does their popularity. Why? 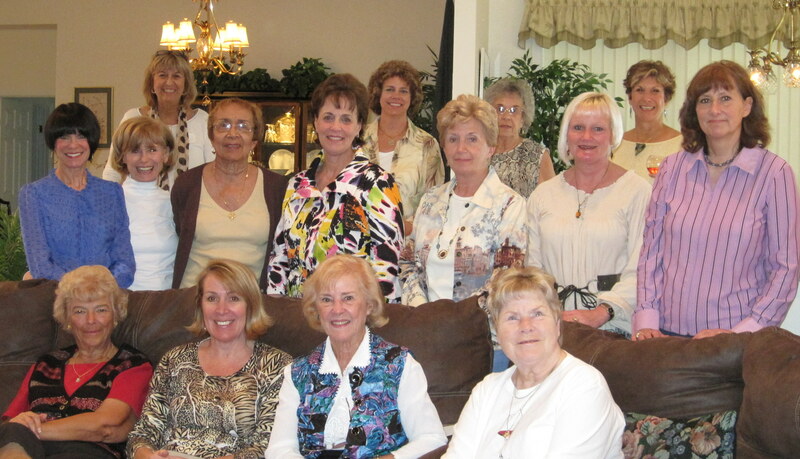 Being a writer, I do of course belong to a book club – it’s called the Analyze This Group and shown above is a snapshot of the terrific gals who attended our most recent meeting. Although I can’t speak for the vast number of clubs across the country, I can tell you a bit about our Book Club. Our members almost never miss a meeting unless it is absolutely, positively, unavoidable…something the magnitude of a death in the family, or a flat-on-my-back-will-die-if-I-move sickness. We all read the book – and – we discuss it at length.We don’t simply decide we liked or disliked it; we study the characters’ actions and alternatives, compare their experiences to ones we ourselves have undergone, laugh at their (and our own) haphazard missteps and sometimes even shed a tear because of their plight. At times a meeting will start with a negative comment about the book, but even that inevitably leads to an exploration of the protagonist’s motives and ultimately a greater understanding of the story. Although I am a voracious reader myself, my book club buddies have introduced me to a number of new authors and wonderful stories that I most probably would never have read. We have over twenty women in our group, and several others waiting to join, but members seldom leave, because Book Club is more than just a discussion group, it’s an afternoon of unbridled friendship. Of letting go of things you may not have talked about for years and knowing that not one of your friends will think less of you, or carry the tale elsewhere. It’s having a glass of wine, the type of food we don’t make for our husbands, and conversation that is thoughtful, intelligent and stimulating. Book Club is having twenty wonderful friends, any one of whom I could call for help, even in the dead of night. Sure, I’ve had times when I was so rushed I barely had time to shower before dashing off to the meeting, and we’ve read a few books that were rather forgettable …but I still would not have missed the experience of a single Book Club discussion. Some people claim their life is too busy for reading, not to mention a full afternoon for the discussion…I pity those poor people. The truth is, a life such as that only seems full, but in things that matter it is most probably empty. Books enrich us with knowledge, entertainment and quite often memories of things we might otherwise have allowed to be forever entombed in our cranial data base. Books take us to places we may never visit, introduce us to people we will never know, and with the turn of page can transport us back and forth through time. Through books our world grows larger and our personal problems seem smaller. Not only does participation in a book club give us all of that, it also challenges our mind and opens the door to new friendships. Analyze This meets the first Tuesday of every month and our meeting is held at the home of the person who selected the book. We chat, catch up on each other’s lives, have a glass of wine, delicious food and after this hour (or two) of socializing, we carry our wine glasses into the living room and settle in for an exhilarating discussion, which inevitably leads to a few tales of our own personal experiences and the unveiling of emotional memories. Yesterday we had a lengthy discussion about memories and after a fair bit of back and forth decided that memories are wonderful little snapshots of life…whereas memory is that vast data bank in the back of your brain where tragedies, lost loves, and broken dreams are filed away. The Analyze This Book Club is indeed a reading group, but they are also a very intelligent discussion group, gourmet chefs (for that once a month) and part-time therapists (when necessary). But more importantly, they are friends…and I shudder to think how empty any of our lives would be without our wonderful Book Club Buddies. Oh, and did I mention there’s food? ← A Book Club Discussion With The Author…What Fun! Bette, what a wonderful description of our truly fabulous book club! Thank you! I LOVE LOVE LOVE Book Club. We started one at the Savanna Club, had all the above fun for about six years- yes, we also took pictures of the people (about 17) who came regularly. Our list of books ended up being long and wonderful. Now, the reason we began it: After reading chapters of our first book, one of our agents remarked, “Don’t you two ever read?” Insulted, we realized that we hadn’t for a lot of years, sooo we got that going. We miss the intimacy you mentioned as someone else took over a year after we stopped (to do plays with the theater group we also founded). The new person has been at it for a few years now and showing her fatigue; so, perhaps it’s time to step in again??? Thank you for that article. We still have writers groups meet at our home, but it is always here. Maybe that should change too? Meeting at the clubhouse is not as easy as it sounds. P.S. We like to drive around, talk for ideas. On long drives, we listen to books on CD’s- mostly mysteries. Get them on Amazon – used. Need to set up a website again, too. My group is very small, only 5 of us. However, we’ve been at it for several years. When we come across a book that doesn’t ‘catch on’ the discussion is usually quite brief and we move on to other topics. This group always makes me smile! Bette, This is my first time checking out your site. I can’t believe how fabulous it is. You are such an inspiration to all of us. You make me want to grow as a person and learn new things. Your incredible. I will be checking in regularly from now on. The pictures were an added bonus. I sent an email to all my friends back home to check it out. My last neighborhood has a great group of women whom I think will be inspired to start a book club. 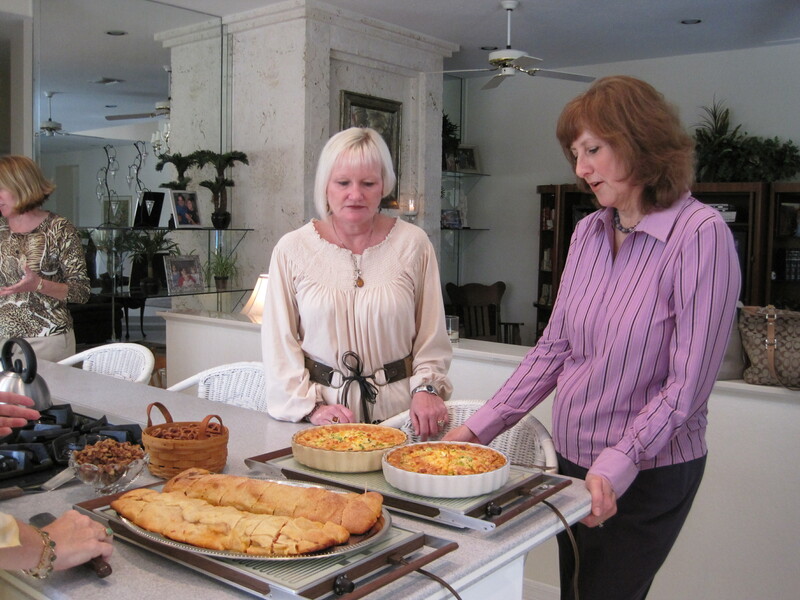 What a great way to get together with your neighbors and friends and socialize and share thoughts and ideas. Keep up the great work your doing. Looking forward to reading more of your published books in the future. Best of luck. 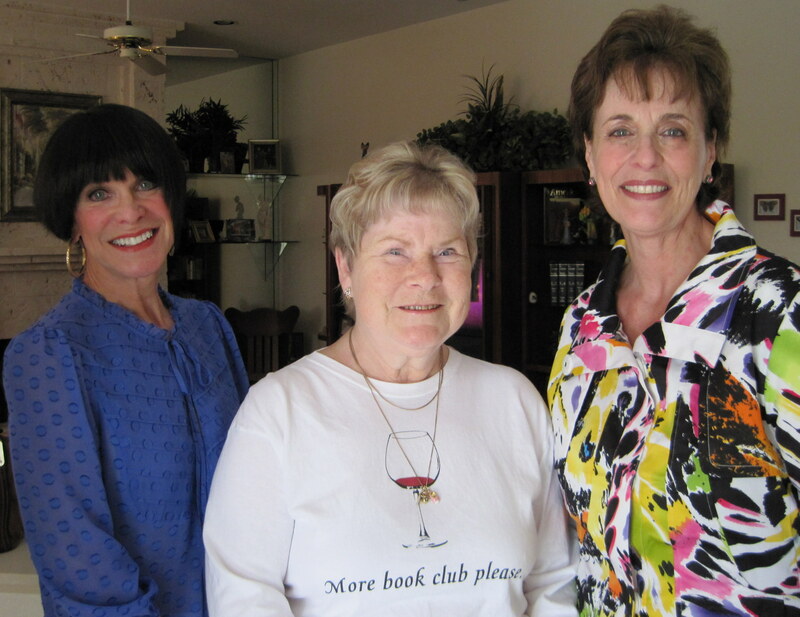 What a great article on book clubs. Your book club sounds wonderful,we have no book clubs here and no one wanting to have one. Are you on Facebook? If so, there is an awesome book club called the Long Distance Book Club – It is a closed group but friend me on Facebook and I’ll be happy to introduce you.